Across between muffin tops and Irish soda bread — albeit a sweeter, more moist version — these unique almond scones are a terrific grab-and-go breakfast or snack to have on hand. Even better, the batter only takes a couple minutes to mix together — they really couldn’t be much easier to make! 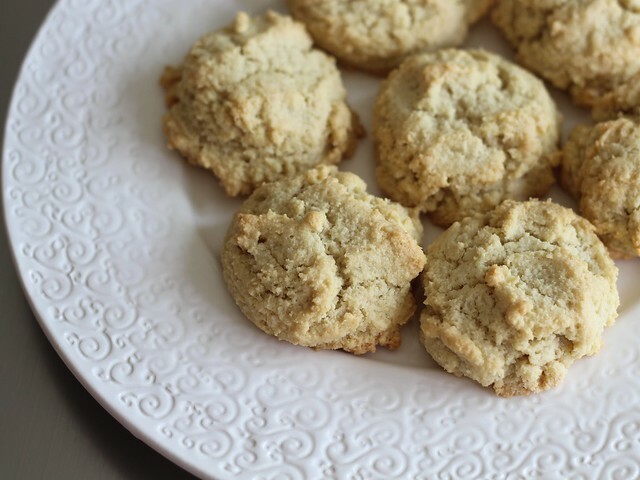 The original recipe for these scones calls for agave nectar, but without fail batch after batch would turn out super wet inside and very, very dark on the outside. (That’s the trouble with liquid sweeteners.) My mom and I played around with a few different ratios of sugar to agave, but our favorite version skipped the agave altogether. You could probably get away with reducing the sugar to a quarter cup, but I’d recommend giving the recipe a go as written first — it produces consistently tasty treats every time. Looking for more almond flour goodies to start your day? Definitely check out these almond flour pancakes and my take on b. Patisserie’s almond cake — you can’t go wrong with any of these recipes! What’s your favorite breakfast to eat on the run? Let’s chat in the comments or on Facebook or Twitter! Feel free to fold about 1 cup semisweet chocolate chips or chopped bittersweet chocolate into the batter just before scooping onto the baking sheet. Preheat oven to 350°F. Line a large, rimmed baking sheet with parchment paper; set aside. In a medium mixing bowl, whisk together almond meal through baking soda. In a small bowl or measuring cup, whisk together oil and eggs. Pour egg mixture into almond flour mixture, and stir by hand until well-combined. Onto the prepared baking sheet, divide batter into 12 equally-sized mounds (about 2 – 3 tablespoons each); using your fingers, flatten each slightly. 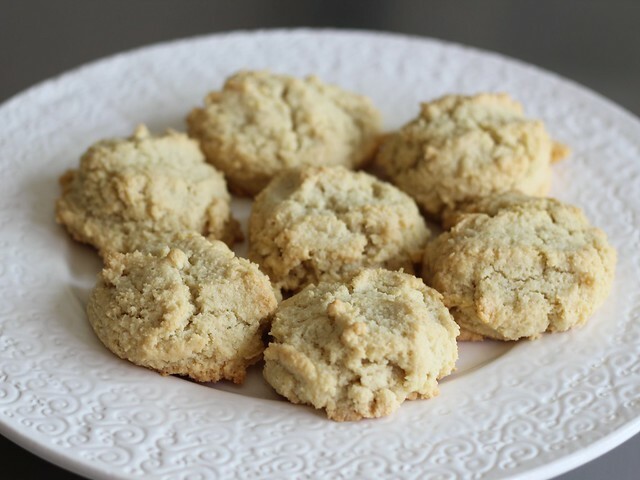 Bake in the preheated oven for 15 – 18 minutes or until bottoms are golden brown and a toothpick inserted in the center comes out clean (if broken in half, they’ll appear somewhat wet in the middle still, but that is just the nature of almond flour). Allow to cool slightly or to room temp before serving. Wrap up cooled scones and store in the fridge for several days, or in the freezer for longer. I suggest packaging them up in twos in sandwich bags, then placing them in a gallon storage or freezer bag. For best results, allow them to return to room temp before enjoying — only takes about an hour on the counter for them to defrost from frozen!